As a Senior Advior you are excited to improve business processes, systems and internal control frameworks with a focus on Data Privacy. This is a role where no two days are the same – so you’ll find yourself taking on plenty of new responsibilities as you go. The objective of our Data Privacy services is to provide clients with a candid and reliable overview of their data privacy landscape. Our solutions can be used by our clients to build confidence and trust with their customers, the overall market and when required by regulation or contract. Our clients are under constant pressure from their customers and stakeholders to demonstrate compliance with Privacy/GDPR standards and that's where EY’s Internal Audit, Controls and Compliance department supports them with Advisory services. As a data privacy Senior Advisor, you will primarily be supporting our larger (multinational) clients in the implementation of Privacy Programs including the execution of maturity assessments, creating data mapping flows and the records of processing, and performing Privacy Impact Assessments. Additionally, you will support in Privacy risk assessments, the development of internal controls around those Privacy risks, and the continuous monitoring of those controls by means of control testing or internal audit. All to support our clients in creating, implementing and verifying their road map for compliance with GDPR. As a Senior Advior you are excited to improve business processes, systems and internal control frameworks with a focus on Data Privacy. This is a role where no two days are the same – so you’ll find yourself taking on plenty of new responsibilities as you go. You’ll work alongside clients and colleagues from also our other GDPR-related departments such as our legal practice (HvG), our Cyber Security team, our Fraud Investigations team and our Certify Point practice. You are balancing your time between developing and guiding our advisors, consulting with clients, auditing, traveling, organizing workshops and supporting business development. If you’re flexible and ready to adapt to a constantly changing environment, there’s no better place to develop your skills. Relevant Bachelor’s/Master's degree in Business Administration, (Privacy) Law and/or Information Systems. 3-5 yrs of relevant work experience in the field of Data Privacy. Good understanding of industry standards in privacy (GDPR, ISO 27018). Able to execute data privacy audits/reviews in line with GDPR regulation and has the ability to assist clients in implementation of data protection / GDPR programs to address confidentiality and security over customer, employee or patient data. Able to articulate threats and risks to business and technology leaders and understand security and privacy concepts and how they apply to business and technology solutions. Able to act as the main point of contact for your team and the client. Posseses project management skills with the ability to collaborate with teams across multiple locations. Posseses problem-solving and proactive mindset with good auditing and interpersonal skills. Abel to flag problems in an early stage and be a sounding board for your clients. A team player but not team dependent. Possesses an entrepreneurial mindset and willingness to assist in business development and new solution development. Able to ask the right questions as the role demands tremendous exposure to the management layer of our (international) clients who are leading organizations in their respective industries. A strong command of the English language is a must due to our international clientele. Willingness to pursue industry certifications e.g. CIPP, CIPM, CIA, ISO 27001 etc. Highly motivated individuals with excellent problem-solving skills and the ability to prioritize shifting workloads in a rapidly changing industry. An effective communicator, you’ll be a confident team player that collaborates with people from various teams while looking to develop your career in a dynamic organization. As a global leader in assurance, tax, transaction and advisory services, we’re using the financial products, expertise and systems we’ve developed to build a better working world. That starts with a culture that believes in giving you the training, opportunities and creative freedom to make things better. Whenever you join, however long you stay, the exceptional EY experience lasts a lifetime. And with a commitment to hiring and developing the most passionate people, we’ll make our ambition to be the best employer by 2020 a reality. Find out more here. An assessment as well as a Pre-Employment Screening will be part of the application procedure. 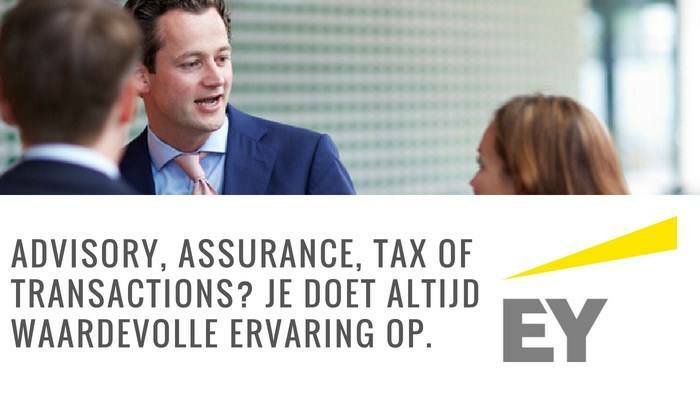 Please send your application for Senior Advisor for Data Privacy at EY in Amsterdam including your CV via our website.